The party had won lone seat of Kanniyakumari in 2014 Lok Sabha polls from where Pon Radhakrishanan was elected. In alliance with the ruling AIADMK, the BJP's C.P Radhakrishnan is locked in a battle with C.R. Natrajan of CPI (M) from the DMK-Congress alliance. 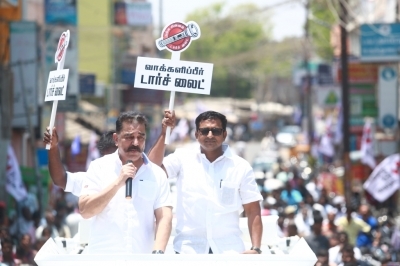 But the contest in Tamil Nadu is multi-cornered as the party also faces challenge from TTK Dinakaran's party AMMK candidate N.R Appadurai, Kamal Hasan's party MNM's R Mahendran and Seeman's NTK nominee S. Kalyana Sundharam. Former finance minister P. Chidambaram's son Karti is pitched against BJP's H. Raja, AMMK's V. Pandi, MNM's Kavingnar Snehan and NTK's V. Sakthi Priya. In Ramanathapuram, the contest is between IUML's Navaskani and BJP's Nainar Nagendran with VTN Anand of AMMK, Vijaya Bhaskar of MNM and T. Bhuwaneshwari of NTK. Pon Radhakrishanan is seeking re-election from Kanniyakumari from where the Congress has fielded H. Vasanthakumar. The AMMK has given ticket to F. Lekshmenan while J Ebenezer is MNM candidate and V Jainteen is contesting from NTK. As per the seat arrangement, the ruling AIADMK is contesting 20 seats while the BJP is fighting from five seats in the state with the rest shared among MDMK, PMK and other allies. Out of the seats being contested by AIADMK, it is facing arch rival DMK only on six seats. There is competition for DMK for other AIADMK partners like MDMK and PMK in rest of the seats.